Hardwood floor refinishing can be a very dusty and messy process if you don’t choose the right floor refinishing process. When comes to restoring or refurbishing your wood floors you have three main services you can choose from. As it ages, hardwood flooring can get scratched and dull. But unlike other types of flooring, hardwood flooring can make a comeback. All you have to do is refinish it. Hardwood flooring can take 10 to 12 complete sanding and refinishing jobs during its lifetime. Engineered wood flooring can be refinished once of twice, depending on the thickness of the hardwood veneer. A word of caution for DIYers: You’ll save money by doing your own wood floor refinishing, but mistakes show up big time. The chief challenge is handling a drum sander — a heavy piece of equipment you get from a tool rental store. Properly handled, it’s a marvel. But linger too long in one spot and you’ll carve a divot that’ll stare back at you for years. Hardwood floor refinishing is dusty and noisy. Always wear a good dust mask or respirator, ear protection, and goggles. Seal doorways off doorways with plastic sheeting and turn off forced-air HVAC to keep dust from circulating throughout your house. There are two levels of refinishing hardwood floors. Buffing is the easiest . If scratches and wear are only on the surface finish and the wood underneath is in good shape, you can restore the topcoat by buffing, a process also called screening. You’ll need to rent a floor buffing tool with a series of screen grits to restore the luster to your floor’s topcoat. A buffing tool is much less aggressive than a drum sander and easier to use. Sweep and vacuum up any dust between each grit. Refinish your floors with either low-VOC water based finish or polyurethane floor finish (about $60 per gallon). Note that hardwood floors that have been waxed or cleaned with an oil soap can’t be buffed unless you first remove any residue. Otherwise, you’ll get a blotchy finish. Use mineral spirits or a wax remover to take off any old wax or oil soap before beginning. Sanding and refinishing hardwood floors gives you the chance to completely restore old, damaged flooring according to the London office cleaners, It also gives you the chance to change the color of your hardwood flooring with stain. Rent a drum sander and a progression of grits — 40 grit, 60 grit, and finish up with 100-grit. Remove baseboards. While sanding, keep the sander moving to prevent gouging the flooring. You won’t be able to get too close to your walls, so remove the remaining finish along the edges with a hand-held orbital sander. After you’ve sanded down to bare wood, fill any cracks with color-matched wood filler. Apply the stain and allow to dry thoroughly before applying two to three coats of finish. Over the last year or so I have been doing business with Janitors Closet Of Tampa Florida located on 4183 E Hillsborough Ave, Tampa, FL 33610. I have purchased carpet cleaning supplies, dehumidifiers, air blowers, and truck mounted carpet cleaning equipment and have been extremely satisfied with their friendly staff, responsive service department and low prices. I was able to purchase all the cleaning equipment and then hired a hotel Cleaning service to come get the rest of the job done for me. When cleaning carpet, Brighthouse Chem-Dry utilizes an innovative method of carpet and area rug cleaning called Hot Carbonating Extraction or “HCE”. HCE is recognized as one of the safest and best ways to clean carpet. Only green-certified solutions are used along with professionally trained technicians that use the equipment necessary with this method of carpet cleaning. The process requires no soap or detergents and uses 80% less moisture than steam cleaning services. It leaves behind no residue and carpet dries fast! Knowing how to clean room and what to do first, will make a big difference with the amount of time it takes and getting the desired routine cleaning results you want. The average 250 square foot room would take a 2 man professional carpet cleaning team about 5 to 10 minutes depending on the amount of furniture needed to move. Hiring a professional carpet cleaner in Tampa that has experience with performing this service will make this job look easy and money well spent. The two main benefits of hiring a professional two man carpet cleaning crew will be the amount of time it will save you and getting the carpet its cleanest (they know all the tricks and tips for cleaning your rug, making it look like new). Have all small items such as shoes, books, and toys off the floor. Remove all breakables such as pictures, and lamps off of tables. Pre vacuum floor to remove dry soil. Slide all furniture away from walls. You will usually need to move the furniture 4-5 feet from walls. Using Carpet Steam Cleaning process clean behind furniture. If any spots remain use spotting agents and then rinse. Steam clean carpet areas with a ph balancing rinse to remove soiling and detergents. I recently spoke to one of my Brandon carpet cleaning clients who is the proud parent of a high-energy youngster. She called me in a panic because he had accidentally stained her leather couch with ink from a ballpoint pen. She wanted to try to remove the stain before having me come out. If you ever need to remove ink from a leather sofa, time is of the essence. A stain is easier to remove right after it happens because leather is porous. 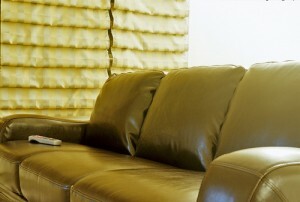 One of the best ways to remove ink spots from a leather couch is to use undiluted rubbing alcohol and a cotton swab. Before you apply any cleaning product to a leather couch, try it on a part of the couch that is not visible to make sure that it will not discolor the leather. • Moisten the swab with alcohol and lightly rub it over the ink stain to transfer the ink to the swab. • Repeat until the ink stain is gone. • Wipe the area with a damp cloth to rinse away any remaining alcohol. • The alcohol will dry the leather, so you may want to use the leather conditioner recommended by the couch’s maker to restore the leather. If the ink stain does not come out, call a professional upholstery cleaning company. National Cleaning Specialists cleans carpets, tile, wood floors, and upholstery throughout Tampa Bay. With more than 20 years experience, our technicians have the spot removal know how to make your leather couch look like new. Get a free upholstery cleaning quote and save 10% by booking your cleaning appointment online or call National Floor Care Specialist at 813.434.1331. Call now! Removing Holloway’s Quick Shine, Orange Glo, or many other wood floor care products can be a very tough, costly and fustrating job if you don’t know what you are doing. National Cleaning Specialist of Tampa Bay can remove and restore wood floors. For removal of wood floor cleaners and floor finish call 813-435-1331 serving Tampa, Wesley Chapel, Brandon, Valrico, Clearwater, St. Petersburg and Lutz Florida areas. or squirt a small amount and spread it with a soft cloth. Apply only enough cleaner to wet the floor. 2. Use the abrasive pad and scrub the area. This should remove the wax buildup. 3. After scrubbing the area, wipe the section with a water dampened cloth. cleaner is applied. Wipe/mop the floor until it is dry – do not leave the floor wet. need to repeat steps 1 & 2 more than once. contractor if abrasion techniques are required. We know many reputable Melbourne cleaning services should anyone need to be pointed in the direction of good cleaning professionals. For help with cleaning or refinishing wood or laminate floors contact National Cleaning Specialist and USA city floors. Dryer Vent Cleaning: Is your Vent Clogged? How do I know if my Dryer vent is clogged? Before hiring a appliance repair man there is one test you can perform yourself to determine if your have a dryer problem or a clogged dryer vent. Remove the old dryer duct from behind the dryer. Replace with new dryer vent and attach it to the dryer. Extend dryer duct line to vent outside of the house. Run your load and see if the cloths are drying normally. If the dryer is working now, you know the dryer vent line needs to be cleaned otherwise you may need a appliance repair technician or a new dryer. While cleaning carpet in Wesley Chapel, Florida today, we ran across a carpet that had several ink stains. The customer had rented a carpet cleaning machine which had made the ink stain spread into several large areas. The first step we used in removing the carpet stain was to apply a product called Stain Zone. This was done around the spot which will help prevent the ink stain from spreading. We then used a specialty spotter like P.I.G. to blot and remove as much as the color pigment as possible. We had to do this several times and went through two towels. Once this was done we followed with All Solve to rinse the solvent from the carpet. We also applied a neutral carpet spotter to help remove the stain. Once we went through these steps, we then rinsed the carpet with our Truck Mounted Hot Water Extraction process. The customer was very pleased with the results. Today we cleaned carpets and tile in lutz, Florida 33558. We encountered soil filtration lines around the baseboards and several coffee stains. Just take a moment to think about all the things that hide deep down in the fiber of your carpet: dust, dirt, allergens, bacteria, pet and human hair, grime, and whatever else makes its way via the occupants of your home. So why is it important to regularly clean your carpet? Read below to find the benefits of regularly cleaning your carpets. In case you didn’t know, the carpet fibers act as a filter, eventually collecting much of the dust and allergens that float around in the air. As the months pass, these allergy-inducing particles can build-up in the carpet fibers. If allowed to accumulate, these particles will become airborne again whenever someone walks across the carpet, this is the main reason why in these cases you would need to call in the killeen carpet cleaning company. Only a thorough cleaning can remove these allergens to restore a healthy living environment. Plus, if allergies are chronic, frequent cleanings are often necessary to help alleviate recurring symptoms. If you have light colored carpet, you may have experienced these dark lines that appear on the carpet. This soiling is called filtration soiling because it comes from air passing through the carpet as it is attempting to get through the crack between the carpet and the baseboard or under a closed door. As the air passes through the edge of the carpet pile, this microscopic soiling is deposited there. This occurs over a significant period of time and is not noticed until a build up has occurred. This type of soiling is difficult to remove because the soil particles are so fine that they penetrate deep into the carpet pile, sometimes into the backing of the carpet. Can it be removed? Sometimes. With special products, time and effort, reasonable results can sometimes be achieved. To help prevent filtration soiling, vacuum and wipe the edges of the carpeting on a regular basis. Be careful around the tack strip on the edge of the carpeting, it could nick your fingers! If you are in need of this type of Cleaning we have special products to remove these types of stains. This morning one of my clients in the Citrus Park area of Tampa, Florida needed water extracted from their carpets. The toilet overflowed and caused their carpets to become soaked with water. This may not seemed to be a big deal to the home owner but several problems could have ac cured if they did not act quickly especially since it happened on the second floor. Besides of having standing water, homeowners should be aware of ceiling damage since the sub floor could leak to the first floor, mold and odor issues, and electrical. Turn off the water source – If you cannot determine the source of the water leak, then turn off the water at the water meter. Be aware of electrical currents throughout the building. If flooding exists, do not use any electrical appliances. Take steps to remove as much excess water from your floors until National Floor Care Specialist arrives. Pay attention to possible sagging ceilings which could soften down and possible collapse on top of you. Save any valuables by moving them out of the water. If the furniture is too heavy try placing aluminum foil below the legs for easier maneuverability. Lift the bottom of floor length drapes off the floor to avoid further damage from the water. Does Your Wood Floor Need to be Recoated or Refinished? National Cleaning Specialist of Tampa Bay recommends if areas of your floor have been worn down to the bare wood, if the floor has deep stains or colorÂ differences in the wood, if there’s chipping or peeling, or if your floor cannot be re coated due toÂ factors discussed above, you’ll have to do a complete refinish. Find a high traffic area where the finish is likely to be the most worn, and pour a tablespoon of waterÂ onto the floor. If the water beads up and you can wipe it without a trace, the finish is still working and you don’tÂ need to do anything just yet. If the water slowly soaks into the wood floor, creating a moderately darkish spot, the floor isÂ partially worn. You may be able to get away with a recoating. Consult your wood flooringÂ contractor for the best course of action. If the water immediately disappears into the wood leaving an obvious dark spot, it’s time to refinishÂ the floor. For routine cleaning of wood floors by sweeping and vacuuming along with use of Squeaky Cleaner willÂ maintain the floor’s original appearance.